Ah, copyright! Often misunderstood, but frequently talked about among creative brand owners. The “misunderstood” part I’m referring to? A slew of urban legends and myths (really, downright lies) that I hear circulated and repeated by my clients. Allow me to clear the air when it comes to these misunderstanding. Disclaimer: Of course, none of this is legal advice—it’s just here to educate you. 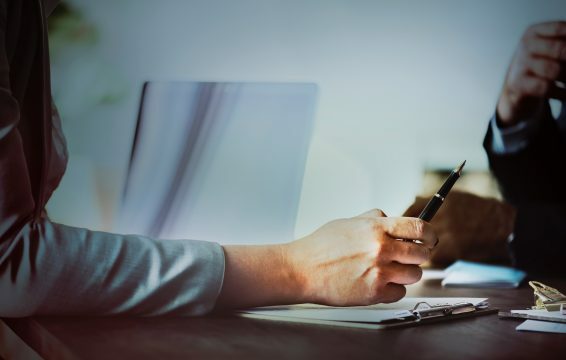 Legal analysis can change based on one single fact, so please be sure to consult a lawyer before taking legal action (or deciding not to act). So, you see? Copyright law actually applies to more than the traditional arts. This concept is sometimes referred to as the “poor man’s copyright.” But the truth is, this does nothing in terms of copyright protection. Copyright protection exists the moment you “fix” your creative work in some kind of tangible media. In other words, once it makes the journey from inside your head to a piece of paper or recording, you have some basic copyright protection in that work. 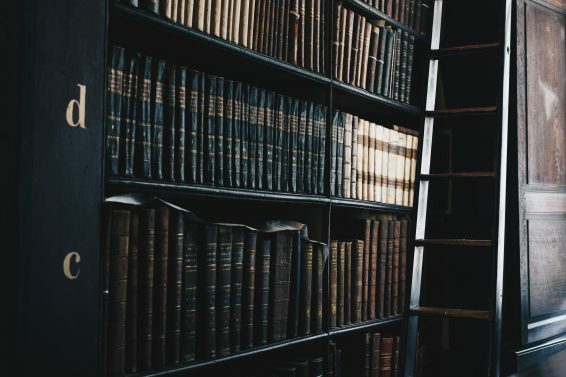 Formally registering a work with the Copyright Office isn’t required for protection, it just comes with several hefty benefits (the ability to get attorneys’ fees covered, establishing a public record of your ownership, and the potential to recover between $750 and $300,000 per work infringed, to name a few). But the mail thing? Pure urban legend. Myth #4: If I pay someone to create content for me, I own that content. 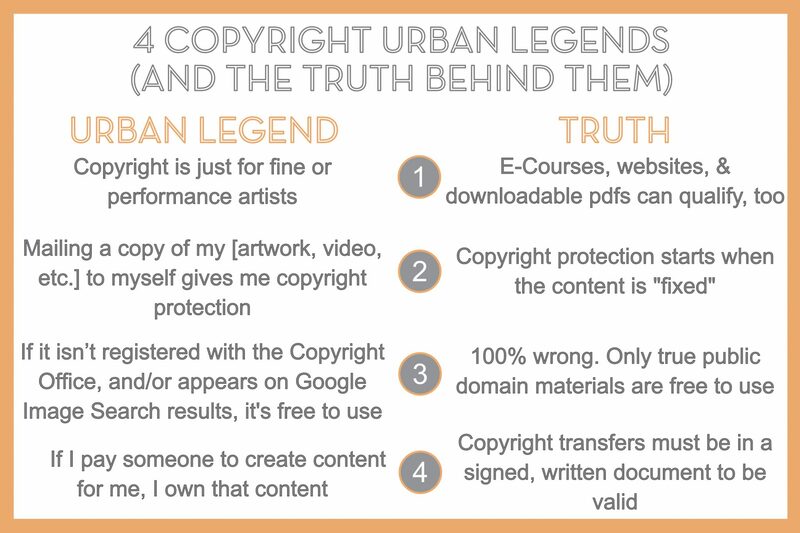 If I had one wish when it came to copyright urban legend debunking, it would be that every creative entrepreneur everywhere would stop believing this one. U.S. law states that copyright transfers are not valid unless they are in a signed written document. Put differently, if you create a website, logo, or other creative work for a client, you technically own that creative work unless there’s a signed written contract that says otherwise. This is great news for the creator, but not such great news for someone that uses a lot of contractors in the course of their business. The law is very much in the creator’s favor (unless the creator is an employee—then a different rule applies). The fix? Get copyright transfers in writing, if that’s part of the arrangement. Now that you’re better educated about the most common copyright myths, spread the word! The more knowledgeable we all are when it comes to these urban legends, the more missteps we can avoid. Maria Spear Ollis is the owner of and sole attorney at Spear IP, a Detroit-based (formerly Nashville-based) law practice that focuses on copyright, trademark, and contract law — particularly in the fashion, hospitality, and internet/tech industries. Maria hates wearing suits and takes pride in her non-traditional, transparent approach to her clients’ legal projects. I just contacted my attorney about sending two cease and desist letters to companies that have the same or similar name. I have screenshots showing the confusion on google, and constantly get calls for one or the other. What would you charge to do something like this for me?